The Jora Composter is an aerating, rotating, insulated compost bin - that's everything you could need in a composter. And the Jora is designed for easy rotation. Because these are rotating composters, that means that fresh waste comes easily into contact with decayed materials, making the composting process all the more effective. Rotating your compost also adds very necessary air to the process, which in turn eliminates unwanted odours. Composting demands a lot of oxygen you know! You can also adjust the amount of air that's supplied to the compost to suit the amount of compost in the composter. Jora's generate heat easily because they are well insulated. This insulation accelerates the decaying process by keeping the temperature at ideal levels which means that your compost is ready to use in only 6 weeks. Your Jora bin has 2 compartments to allow uniterrupted composting. While one bin is full and still decomposing you can start filling the second. And when it's time to empty your decomposed compost. a metal sheet covers your fresher food waste to prevent it from being emptied with the compost. 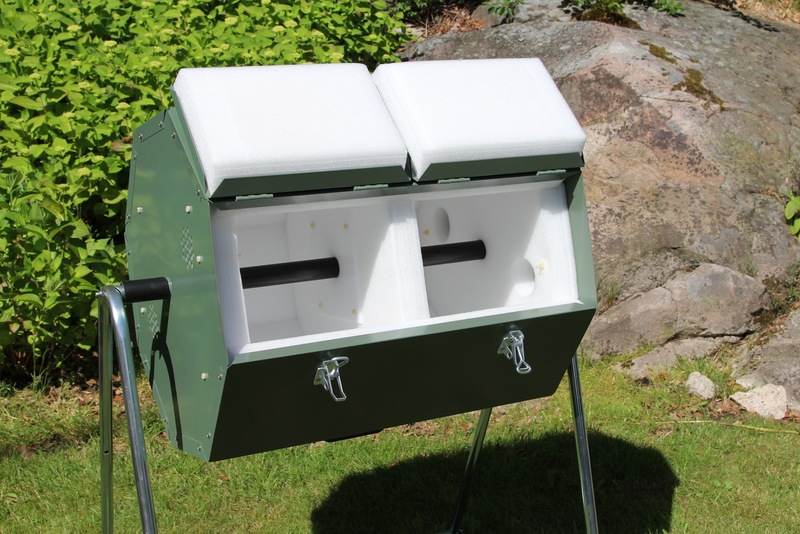 The Jora composter is designed by Swedes who have impeccably high standards. They are made from hardwearing materials that are also recyclable. So you can be assured that you're getting the very best quality when you buy one of these compost tumblers for your home or garden. And composting with the Jora is as easy as 1, 2, 3. Simply add your kitchen scraps, doggie scraps, garden waste to active compost or a compost starter. Keep the air vents closed for the first 2-3 days yo increase temperature and help the materials to decompose. Rotate the composter every time you add more waste materials - this helps to aerate the compost and keep prevent smells. Voila! Your compost is ready in 6 weeks. 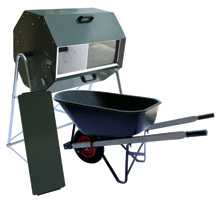 This Jora composter is available in 2 sizes - 125 litre and 270 litre. Both units have 2 insulated compartments and come with a stand which can be ground or wall-mounted. If you want height underneath your composter but don't have a wall to mount it on then we also provide an optional High Stand for mounting for your bin (shown left). Please note: Fixed shipping is calculated for most parts of Eastern Australia & other metro areas. Liked the first, and bought another.